This scalloped potato casserole gets extra flavor and color from some diced ham, carrots, green onions, and celery. Cheese is added to the sauce to make a hearty side dish that goes with any meal. 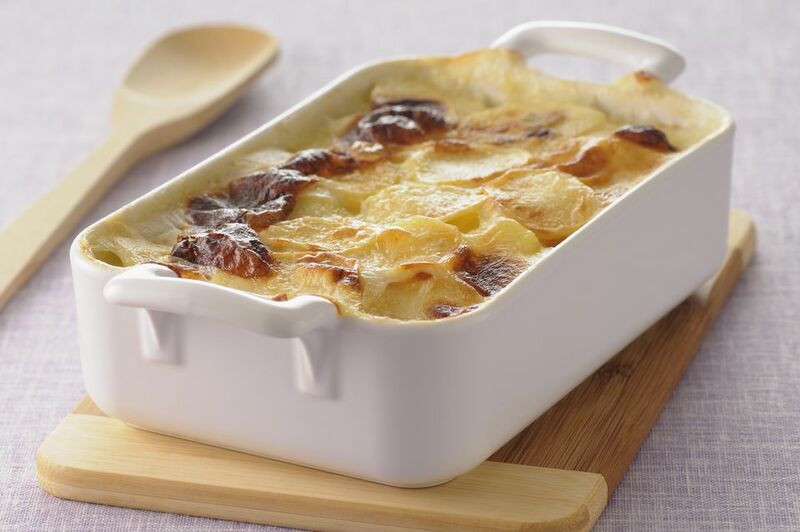 Bake these great-tasting scalloped potatoes for an everyday meal or take them along to a potluck dinner. Feel free to use fewer vegetables, or add a buttered bread crumb topping, if you'd like. In a saucepan, melt butter over medium-low heat; add celery, green onions, carrots, and ham. Sauté, stirring frequently, until vegetables are tender. Add flour, stirring until well blended. Gradually add 1 1/4 cups milk, stirring constantly. Continue cooking, constantly stirring, until mixture is bubbly; add 1 cup cheese. Cook until cheese is melted; add more milk if the mixture is very thick. In a 2-quart casserole, place a layer of the potatoes then a layer of sauce. Repeat for additional layers. Bake at 325 F for 45 minutes; top with remaining 1/2 cup of cheese and bake for about 10 minutes longer, or until cheese is melted. Combine 1 cup of soft bread crumbs with 2 to 3 tablespoons of melted butter. Sprinkle the crumbs over the cheese topping.